Last weekend I finally made it to Millie's Homemade Ice Cream. I'm glad we did because the ice cream was yummy but I'm sad that Millie's is not wheelchair accessible. We parked and I waited in the car while SP ran (literally, so as to not have melted ice cream) and got the ice cream. 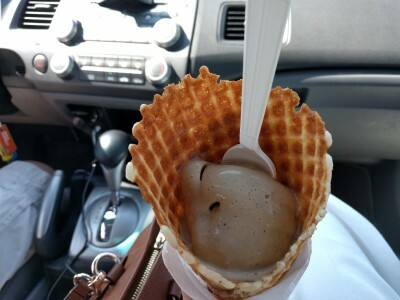 Of course I had to have a waffle cone. I love waffle cones. The ice cream was so tasty. I ate it quickly, not just because it was so good but because it was such a hot day it was quickly melting. I think SP was a little sad that for once in my life I ate quickly. 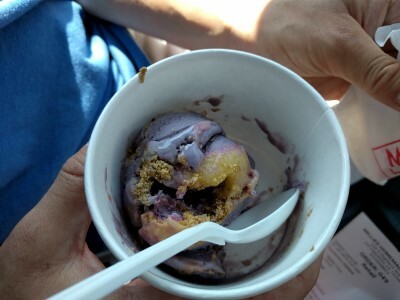 SP chose Blueberry, Graham, and Lime Curd. He loved it. I liked it, but this is more of an SP flavor than a me flavor. I wish we lived closer / that parking was easier / that it was accessible. It's definitely delicious ice cream. We finished watching Stranger Things and loved it. We were amazed at the eclair nun towers created by the bakers on The Great British Baking Show. One baker flavored hers with bubblegum flavor! These are actually called Religieuse à l’ancienne and are large éclairs, stood upright with no doweling, and decorated with buttercream. I was surprised at this week's Animal Kingdom. As the episode progressed, I had a feeling of what would happen, but I was still surprised. We started OITNB Season 4. We went to see Jason Bourne. I love the Bourne movies. The Bourne books were (are) some of my favorite books. They are some of the first books I read that my dad and grandpa also read. The plot was a little thin, but Matt Damon is still a great Bourne. Someone is pretty excited for Suicide Squad this weekend. We'll see if we make it. It's a busy weekend, so this movie might have to wait a week. I read Lilac Girls by Martha Hall Kelly and it was so, so good. I had a hard time picking it up since it is set during World War II and I've read a lot of WWII books lately, but once I started reading, I was hooked.